Girl's Steve Madden Tights, Legwarmers & More from $2.50 + 10% Off or Free Shipping! 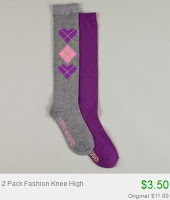 Right now at Totsy you can score little girls' Steve Madden tights, legwarmers and knee-high socks starting at just $2.50! There are several different colors and designs to choose from each product. Sizes are 4-14.